Available by the week - every week in the summer! #1 June 12-14. Tumbling Camp. Use of the 30 foot air trampoline, flipping harness and gymnastics equipment. This week may be purchased by the day due to Wake County School System’s last day of school is on June 11th. Scroll down when purchasing for day rate. #2 June 17-21. Breaking Camp. Boards, Apples, Balloons for learning special breaking skills. Students will perform their skills in a friendly competition at the end of the camp. #3 June 24-28. Music Camp. Introduction to a variety of instruments including guitar, drums and keyboards. Billboard Charts “Latino Composer of the year” will assist campers in song composition and starring in their own music video. #4 July 1-3. Each day will be filled with obstacles, targets, and challenges to test your nerf skill set. You may bring your own nerf supplies or you may use ours. This week may be purchased by the day, we will be closed on the 4th and 5th. Scroll down when purchasing for day rate. #5 July 8-12. Self Defense Camp. Learn to defend yourself against a larger, stronger and faster opponent by utilizing leverage, pressure points and joint locks. Skill sets will include tumbling and rolling techniques. Training will be modified depending upon age and skill level. #6 July 15-19. Gladiator Camp. Enjoy a variety of challenging obstacle courses, gladiator style games and more. #7 July 22-26. 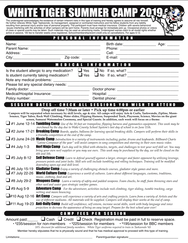 World Culture Camp. Experience a world of cultures. Learn about different languages, customs, traditions, music, clothing, food and art. #8 July 29-Aug 2. Weapons Camp. Learn a variety of safety and padded weapons. Foam chucks, bo staff, foam throwing stars and other nerf and watergun strategic warefare games. #9 Aug 5-9. Adventure Camp. For the adventurer, activities include rock climbing, tiger sliding, tumble tracking, cargo netting and moon bouncing. #10 August 12-16. Art Camp. 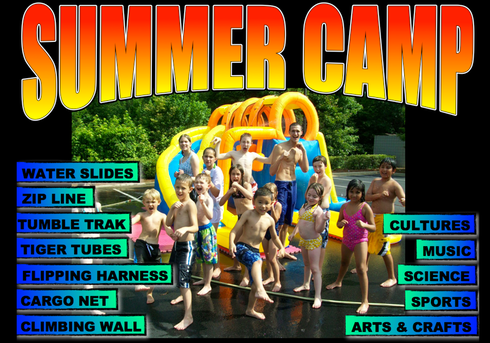 Campers will experience a variety of arts and crafting projects. Learn from a variety of Artists and using different mediums. All materials will be supplied. Campers will display their works at the end of the camp. #11 Aug 19-23. Anti-Bully Camp. Build self confidence, self esteem, develop social skills, work with body language and voice projection to decrease the appearance of being an easy target. Prepare for the best school year ever!